Größe dieser Vorschau: 507 × 600 Pixel. Weitere Auflösungen: 203 × 240 Pixel | 406 × 480 Pixel | 700 × 828 Pixel. 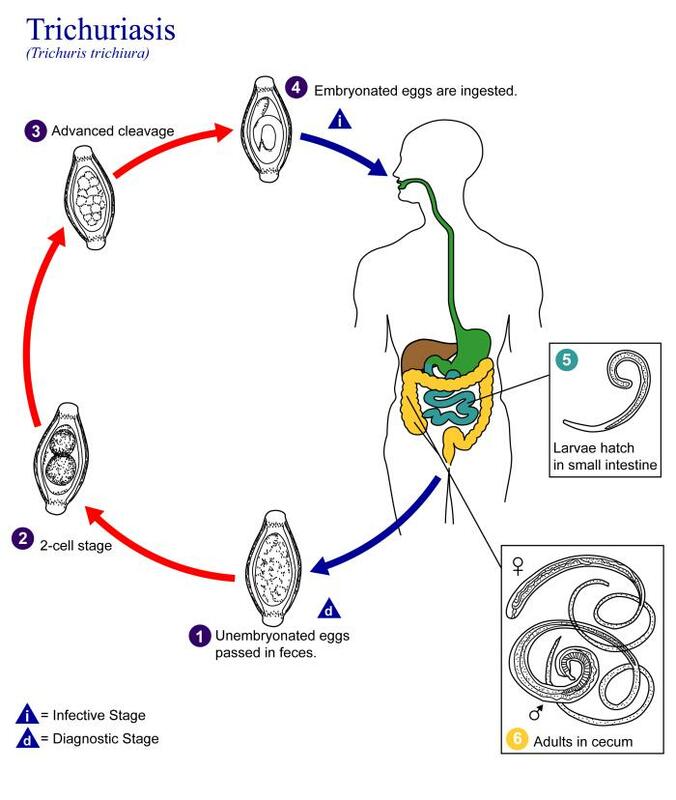 The unembryonated eggs are passed with the stool. In the soil, the eggs develop into a 2-cell stage, an advanced cleavage stage, and then they embryonate; eggs become infective in 15 to 30 days. After ingestion (soil-contaminated hands or food), the eggs hatch in the small intestine, and release larvae that mature and establish themselves as adults in the colon. The adult worms (approximately 4 cm in length) live in the cecum and ascending colon. The adult worms are fixed in that location, with the anterior portions threaded into the mucosa. The females begin to oviposit 60 to 70 days after infection. Female worms in the cecum shed between 3,000 and 20,000 eggs per day. The life span of the adults is about 1 year.